Special meeting to approve donation of the sum $17,300 to the Kalamazoo and South Haven Railroad Co. with the sum to be raised by selling “coupon books” in the denominations of not less than $100 and not more than $1000. Special meeting to aid in the construction of the “Chicago and Michigan Lake Shore Railroad”. The sum of $40,000 bonds to be deposited with state treasurer and to be delivered to the treasurer of the railroad company when the line was completed through the township. General election held for township officers, supervisor and clerk. Messrs, Dyckman and Hale offered to sell the township 21 3/4 acres adjoining our present burying grounds for $2000 at the interest rate of 7% for drain 1877 Voted to be raised and spread upon tax roll of 1877 for library purposes $50.00 of the 2mil| tax. Annual meeting held at the building on south side of Phoenix St. third door west of Center St.
Dog warden added to list of paid officers for township, A telephone was placed In hall. Set regular library hours all day Wednesday and Saturday from 8-noon. The electric railway franchise from Kalamazoo to South Haven was granted. A bill to authorize the township to raise or borrow money and Issue bonds (not to exceed $50,000) to purchase a site and for construction of a courthouse and jail for Van Buren County. 269 votes cast with 253 against and 16 for. Township proceeded to purchase one acre of land from Mrs. Grasse for site of township hall. Board viewed area where hall should be build. Cost of land and building material was $1300 with any left over apply to future elections. Fred Kohlhoff was awarded $10 for the damage to his house. Special election held on 9/21/1912 to procure the sum of $25,000 to build Stone roads in the township. Audit of treasurer books done and found to be correct with a balance of $1686.53. 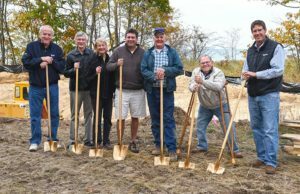 Township board officials granted the Kalamazoo/South Haven Railroad to construct a siding at Fruitland station of unloading of stone for future Stone road building. Board also voted to raise township expense fund to $1500/annually. Stone Road is now called the Monroe Road and later called Monroe Blvd. The Justice of Peace used township hall for holding court and to be responsible for any damages done to property. Board asked permission to borrow sum of $25,000 and issue bonds for expense of macadamizing and building stone roads, repairing the necessary bridges. Authorized building Tannen School House Road to Phoenix Rd. for a sum of $5000, Board also agreed to pay $5 to Dr. Pinoyer for care and x-ray for Orville Finn. Archie Siller was appointed a Health officer for an annual salary of $100. Special meeting to take action on petition of the Apple Orchard subdivision – motion carried that plat be approved. Franchise for electric light and power line brought before board and a request for a franchise for water main to be extended into the township. Motion made and supported that township register qualified voters. South Haven City was granted a 30-year franchise for electric power and maintenance of power lines. Following delegates to be sent to the Republican County Convention held at Hartford: Larry V. Chaddock, George E. Chatfield, Charles D. Leisering, and Henry Pearce. Clerk instructed to have ballot boxes repaired with new inner and outer lids to conform to the state law. Motioned and supported that 3/4 mile of gravel road be constructed on Spring Hill Road from Kalhorn corner to Larsen road. Committee formed to interview members of South Haven City Council In reference to fire protection. With the passing of Supervisor Henry Pearce, George Chatfield was nominated as chairman of the board. John A, Schnake was appointed to succeed Pearce. Letter sent to Van Buren County Board of supervisors to advise them of appointment. Lester Richards, Inspector of the Orchards in South Haven submitted his bill for $40 (10 days at $4/day). Board to approve and grant the franchise for Electrification Assoc. subject to ratification by the electors at a special election to be held 9/15/1936. Board made resolution to resolve that they enact rules, regulations, and conditions to provide for the licensing of Junkyards or second hand dealers within the township. Township attorney was asked to draw up a new ordinance for license Issuances for Junkyards. Clerk asked to call for bids for repairing the chimney of township hall. Low bid of $200 accepted. Discussion held to install sanitary sewer and plumbing In hall If It is the will of the people. Low bid was $145 to have septic system, plumbing, toilet inside at hall. Motion and support to pay bill of $301 to have the County Surveyor survey and make plats of each section of the township for purpose of correcting tax roll descriptions. Clerk was instructed to purchase two new ballot boxes with the size to accommodate ballots to be cast in November election. A locker was build for the storage of township records. Mrs. Gertrude Van Dyke appeared before the board requesting renewal of dance hall license for the Hayloft. accounts, as is the rule, all were found to be in order. The matter of extension of water main from the city to township was discussed. Mr. Randolph B. Monroe offered two public acts that would enable the township board to provide an extension of water mains. They are P.A. 47, 1941 and P.A. 107, 1941. Mr. Clarence Fritz explained that a reduction in fire insurance rates for certain properties if fire hydrants were installed. necessary for those persons interested to determine where, how far and what size mains would be required. This list would then be presented to the BPW for the cost and supplying water. Mr. Smith made the statement that the City of South Haven would NOT finance the project. No health officer or orchard inspector has been appointed pending further action on information from the State Dept. Wendell E. Dickerson having been elected on 4/2/45 for the 4-year term as member of the Board of Review and not having qualified for office, it was suggested that the Board find a party to finish out his term. Wm. Barringer accepted the appointment. The question of extension of water mains from the city to certain portions of the township was discussed. Mrs. Caroline Johnson worked several days in the Register of Deed’s office to secure records of property transfer. She was paid $15 for her efforts. It was moved by R.B. Monroe and supported by H.W. Lang that in the event any group of property owners in the township should desire to form a water association on work toward the establishment of a special assessment district for extension of water mains, the township board will cooperate with them in any way provided by law. Motion carried. Mr. Monroe presented a petition signed by residents of South Shore Rd. and also from along M-140 requesting the township board to call a meeting to discuss the facts to have extension of water mains into the township from the city. A meeting with township officials and Sidney Smith from BPW would be held before a meeting of the residents could be called. Motion carried. Mr. Monroe moved and supported by Lang that a meeting of the township be called at the same time as the annual meeting and that all facts and figures and manner of financing could be presented at that time. Motion carried. Moved by Monroe and supported by Leisenning that NO TAX be spread by township expense account, and that one mill be spread for “Library Debt Service”. The clerk received a sum of $100 from the work of re-registration elections. 4/7/47 – Fred Partridge, George Jillson, Kent Drake, Josephine Heald and Mrs. Fred Presley. Marie Harsh and Dorothy Stieve to serve from 6:00 p.m. till close. A meeting was called for the purpose of approving a plat for the Lambert subdivision. Motion by Lounsberry and supported by Drake that the plat be approved as submitted by T.A. Smith, surveyor. A letter from the VB county road commission was read requesting assistance from the township for snow removal for the upcoming winter 1947-48 for a sum of $1000 upon presentation of a bill to the board in the spring. A letter was sent to Mr. Wm. Trade regarding the parking of cars to close to the road near the tavern called “The Cabins” on M-140. The books were audited and all was found in order. A verbal request by Carl York for a hot rod race track at the Trude property. Request was tabled for further consideration. A letter from the Liquor Control Commission approving or disproving a request from the Clifford Welborn Post No. 279 American Legion for a club license for their property on the airport road, east of M-140. Moved by Lounsberry, supported by Leisenning to approve application. Motion carried. Mr. R. B. Monroe offered objections to granting a license. The clerk was to send a letter to all residents within a radius of 1/2 mile and asking them to come to a board meeting on 5/2/50 at 7:30p.m. Concerning racetrack – after reading letters returned and listening to opinions of people present, the racetrack was voted down 5-1. Motion by Leisenning, supported by R. B. Monroe that the license be refused. Motion carried. The following resolution was adopted: for the qualified electors who are residents in the N1/2 of NE fractional 1/4 of section 16, township one south range 17W on the following question:Shall properties in this area be annexed to the city of South Haven, Van Buren County, Michigan:The voting went as follows: 23 yes and 13 no. Moved by Monroe and supported by Leisenning. Cherry St., Chambers St., Stone Road (Sherman Road), Stieve Rd. and Schnake Rd. in the amount of $23,799.15. Motion carried. Hartford in the not to exceed price of $6490 (Spring Hill) and $7985.40 (Roxy). Construction would begin right away. Petition was filed with the township for “Spirits by the Glass”. Finding that all was in order this proposal would be placed on the 11/5/52 ballot. A discussion regarding the adoption of a Zoning Ordinance for the township was held. It was the opinion of the board that such an ordinance could possibly be of benefit to the township. control building in the township. If a suitable ordinance can be drawn up, the residents should be notified of a public meeting to be held in late October at the hall. Copies of the ordinance should be circulated in advance of the meeting. Meeting to be held for the purpose to determine if changes in the ordinance be made or if it should be adopted. Motion carried. It was moved by r. Sherman and supported by E. Stieve that the question of a building ordinance for the township be tabled until a further date. Motion carried. It was moved by Stieve and supported by Sherman that the township contribute the sum of $200 to the South Haven Airport. Motion carried. The renewal of the permit for the Hayloft was rejected by the board because of the problem of noise caused by patrons at the Saturday night dances. Ruth Monroe resigned as a member of library board – Pearl Urist was appointed to fill the rest of her term. license fee and bond fee. License denied. Added to Resolution No. 2 “Ordinance to License” to regulate used car lots. The Goldberg’s once again submitted a check for $25 license fee and $200 for bond in accordance with Resolution No. 2. It was moved by Stieve and supported by Sherman that the clerk return the checks and that they be requested to file an application in compliance with Resolution as amended 3/10/56 and effective 3/20/56. The zoning board shall consist of a seven member advisory board of 2-5 members. Moved by Hope Parks and supported by E. Stieve that the resolution be adopted. Motion carried. The following persons were tentatively appointed to acquaint themselves with the duties of such a board and to assure us of a permanently functioning board to comply with all provisions of the law: Maurice Olson, Frank Lambert, Ivan Stein, Mrs. Ted Neuoffer, T. Richard Tinsley, Frank Antonson, Harvey Hollis. Advisory board: Wm. McDonald, Pierce Barner and Charles Valkner. Moved and supported. Motion carried. resolution and appointing a qualifying a permanent board. Notice of meeting was published in the South Haven Tribune written 10 days of the adoption of this resolution. M-43 and Summit Rd. and Maple Grove Rd. M-140 and Maple Grove Rd. South Shore Rd. and Pilgrim Haven Rd. Airport Rd. and Summit Rd. Township board agreed to pay an annual sum of $23.40/light directly to the BPW. This would be reviewed yearly at the regular meeting in July. The township board again denied the Goldberg’s their application for a junkyard in Sec. 14 and returned their fee of $25 and $200. Ivan Stein resigned from the township zoning board because he had been appointed to the Van Buren County Zoning Board. Mr. Chas. Valkner to be appointed to replace Mr. Stein. AVM Corporation was paid $330.45 for two voting machines #92799 and #92800. Cost was $150 each plus $30.45 for delivery. The township had been renting the voting machines and they agreed that the balance be paid off from the Government Bond fund. Annual audit performed and all was balanced. Michigan. Moved and supported that a resolution be adopted and a copy sent to Sen. Edw. Hutchison with copy to Representative Edson Root. Motion carried. More streetlights were ordered for the township with same terms and conditions as previous order. Mitchell Bros. purchased an old horse-drawn grader that was in very poor condition after 20 years of service. The brothers paid $15 for it. Moved and supported that the plat of Marwood Subdivision located in the west fractional of Sec. 21 be approved by the board and the clerk affix his signature thereto. Motion carried. US31 (east side) Crook St. to 6th Ave. US 31 (west side) Superior to 6th Ave.
6th Ave. Cherry St east 1200 ft. The Levertons, Tesluks, and Kelloggs were present at the meeting and voiced their concerns about connecting to the city sewer system. They stated that they were already connected to the city and could see no reason to pay again to a new sewer hookup to their property. A special meeting was scheduled for 5/22/58 for a review of the special assessment roll to be held at township hall at 8:00 p.m. Notices would be published and posted in three public places. Charles Halloch came before the board to ask permission of the use of Maple Grove school to use the township hall for grades 5 and 6. The request was backed up by the Fire Marshall stating school was crowded. No action taken until more information was received from the State Fire Marshall’s office. Special meeting was called by Meyer Warshawsky, attorney for Van Buren County road commission and asked the town board to pass a resolution as soon as possible to enable the BPW to advertise for bids and award contracts for the special sewer assessment district. A plat of the subdivision known as Springhill Acres was presented for approval by the board being in compliance with the requirements of Sec. 30, Act 172 of 1929 as amended. Was moved and supported that the plat be approved as presented. Fire Chief Lester Olmstead present to the board an outline to use existing irrigation ponds and other sources of water supply to fight fires. Mr. Torp reported he had been called upon by a representative of the State Fire Marshall’s office who stated that some alterations had to be made to the hall before it could be used as classrooms. The exact nature of the requirements were sent in a letter to Maple Grove School district by the fire marshall. Please accept my resignation as Trustee of South Haven Township Board, as I’m no longer a resident of South Haven Township. Moved and supported. Charles Wilson be appointed to serve out the unexpired term of Schnake. Motion carried. Moved and supported that the plat of Evergreen Bluff be approved by the board. Clerk’s signature was affixed to the document. Motion carried. Letter was received from the South Haven Township Improvement Association asking for a progress report on a dump location. Moved and supported that the BPW be advised of the acceptance of the terms in their letter this date to extend the sewer tap to the property line of the township hall at a cost of $80 plus $1.95 service charge per month. Motion carried. Mr. L. Ingram was sole heir to the John Kirschman Estate. It was suggested to the township board that they should negotiate with Mr. Ingram for purchase of property for the township dump. Mr. Ingram stated that he did not want to sell the property at this time. The board must now search for another property for a dumpsite. Eight residents in the immediate vicinity of the “Hayloft” to protect the granting of a dance hall license. A proposed used car lot ordinance for the township was read. Torp suggested that the local used car dealers be invited to attend a meeting to discuss the ordinance. Moved by Torp and supported by Lambert that a 1% collection fee be collected on all 1959 taxes until 2/29/60. Motion carried.